Koh Tachai: Why so many dead fish? At the end of the 2015/16 season, the Similan Islands national park announced that Koh Tachai was to be closed. We wrote about the details in a blog we named ‘Who Killed Koh Tachai?‘. This title was meant to be tongue in cheek, we didn’t expect it to become literally true. So where did all of these dead fish suddenly come from? Koh Tachai is currently closed to beach visitors, but scuba diving is still allowed on Koh Tachai pinnacle and several dive sites around the island. Koh Tachai is part of the Similan National park, off the west coast of Thailand, and was reopened to divers on the 15th October 2016. We were desperate to see what the conditions were like, as there had been some very unusual reports in the week prior to this. On the 10th October 2016, roughly 5 months after the closure, the DNP (Deparment of National Parks, Wildlife & Plant Conservation) made an incredible announcement. It was reported that in the five months without any tourist activity, there has been an ‘80%-90% recovery of wildlife and coral reefs’. Many people were skeptical. We were on one of the first Similan Liveaboards to go out this season and we dived at Koh Tachai Pinnacle on 17th and 18th October 2016. The first thing to say is that the coral reefs have most definitely not had an 80%-90% recovery rate. The event that has done the most damage in recent years was the global coral bleaching event of 2010. Since then, the reefs around the Similan Islands have been slowly but surely improving. One positive bit of news is that the 2015/16 global coral bleaching event (by far the worst on record) has had no visible impact on the Similan Islands. This suggests that the coral currently growing is becoming more resilient. So even though coral is recovering, the statistics given by the DNP are as unbelievable as they seem. All of these photos were taken by just one diver on a single dive at Koh Tachai South reef. The majority of dead or dying fish were eeltail catfish, but not all. As you can see there were grouper, sand perch, squirrel fish and other divers spotted parrotfish, damsel fish and several other species. We also spotted live catfish that looked like they would die soon as they were wriggling around on the sea floor. We dived at Tachai Pinnacle, Tachai South and Tachai South-East reef. There was evidence of dead fish everywhere. However, the majority of fish were still alive and healthy. Koh Tachai Pinnacle in particular had huge schools of barracuda and fusiliers. The dives here were some of the best on the trip. After contacting several agencies, our first response came from the Department of Marine & Coastal Resources (DMCR) on 20th October. They told us that it was ‘probably from fish blasting’. This would be very disturbing if true, as it is part of a protected national park. Dynamite fishing is something we have covered extensively on our Myanmar Diving page, as it is a much more common practice there. From our experience, what happened at Koh Tachai did not look like dynamite fishing. The fish were too spread out and still the majority were alive and healthy. It seemed to be only select individuals that had died. On the 24th October we received updates from both the DMCR and the DNP. They told us that ‘after getting informing about the unusual situation, the national park officers went to check the area’. They informed us that there was no sign of damage to the reef and that blast fishing was a ‘low possibility’. They suggested that the most likely cause was ‘low temperature and low oxygen seawater’ arriving as part of ‘internal waves’ from the continental shelf. This phenomenon is often know in the diving industry as the ‘Green Monster’. GREEN MONSTERS ARE KILLING THAILAND’S FISH! For those who are fans of tabloid headlines, the one above could have been a great title to this article. What divers refer to as a ‘green monster’ is actually called a Large Amplitude Internal Wave (LAIW). 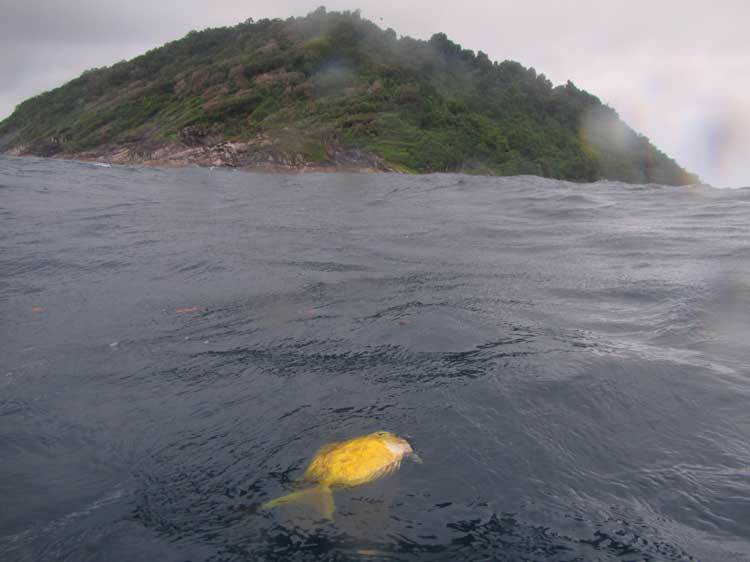 This phenomenon has been covered in detail in our study of Similan diving conditions. In short, cold water rises from the depths of the Indian ocean as it approaches a dramatic change in depth on the far West of the Andaman Sea. This is illustrated in the video below that shows how internal waves are created in the South China Sea. The principle here is the same. The reason divers refer to this as a ‘green monster’ is because you can see these walls of low visibility water approaching during a dive. They appear green and are seen as monsters because you know the temperature is about to drop dramatically. As we have previously reported, these LAIW are having a positive effects on the coral reef. The theory proposed by the DMCR is that, particularly during seasonal changes, LAIW can have negative impacts on fish populations. The colder water is low in oxygen and this can cause many fish to die. This is currently the most popular theory and has also been reported in the Krabi province to the South. The DMCR have still been careful to say that the ‘exact cause needs to be carefully analysed’. We will keep you updated with any future information. If this theory of internal waves is true then it is not too serious, as it could be a fairly regular natural phenomenon. The best thing to take away from this experience is that the DMCR and National Park were so quick to react and investigate the situation. If you see anything unusual or something that needs reporting, then please report it. You can contact the DMCR directly, or if you have any trouble then let us know and we will contact them on your behalf. Just send through any information you have and photos if possible. After the closure of Koh Tachai and then the recent announcements of unbelievable coral recovery, there was a lot of sketicism in the diving community. This experience has shown us that there is good work being done and that we can try to work with the appropriate government agencies to make things better. 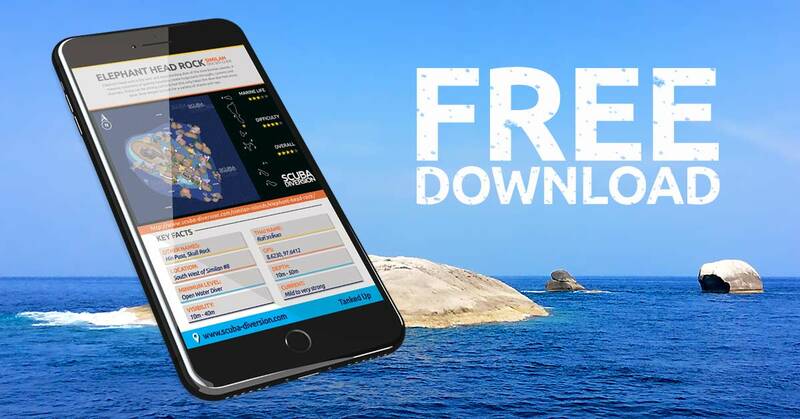 Download our free (regularly updated) Similan Islands dive site guide by subscribing to our newsletter. We do not spam and will only update you with the latest Thailand and Myanmar diving news. Enter your details to sign up to our newsletter & access your free guide. Simply verify your e-mail address to receive the download link. https://www.scuba-diversion.com/wp-content/uploads/2016/10/IMG_0011.jpg 375 500 Chris Buckley https://www.scuba-diversion.com/wp-content/uploads/2017/09/diversion-white-logo.png Chris Buckley2016-10-20 19:09:262018-06-05 09:02:43Koh Tachai: Why so many dead fish? Our new Similan Dive Site Guide features full colour maps and key facts about the dive sites you will likely visit on your Similan liveaboard trip. We will soon be adding more maps and a new Myanmar Diving Guide. Subscribe to our newsletter and be the first to know about our future giveaways, exclusive research trips and all the latest Myanmar and Thailand diving news. Alternatively, view our interactive online guides for diving in the Similan Islands and Myanmar’s Mergui Archipelago. Complete with maps, key points, dive briefings and featured articles. https://www.scuba-diversion.com/wp-content/uploads/2016/05/barracud-1.jpg 321 833 Chris Buckley https://www.scuba-diversion.com/wp-content/uploads/2017/09/diversion-white-logo.png Chris Buckley2016-05-24 16:33:142016-08-13 12:02:18Who Killed Koh Tachai? Off the Chart Expeditions lift a typical scuba diving liveaboard to new and exciting levels. Born out of a passion for exploration and a long history of enjoying life on dive boats our bespoke expeditions offer what we consider to be the ultimate dive trip. In between two of the world’s greatest dive destinations (Raja Ampat & Komodo) lies the Banda Sea. Within this vast sea lie the Banda Islands. And around these islands is a world of marine life, still relatively unknown to the worldwide diving community. Interested in Joining an Off the Chart Expedition? Sign up and get news of our future plans first. The latest news about the Similan Islands in Thailand and the Mergui Archipelago in Burma. Medical advice and practical information for safer diving. Tips and tricks to improve your underwater photography and galleries of stunning photos. October 30th – November 6th 2019 In between two of the world’s greatest dive destinations (Raja Ampat & Komodo) lies the Banda Sea. Within this vast sea lie the Banda Islands. And around these islands is a world of marine life, still relatively unknown to the worldwide diving community. An appraisal of diving conditions within the Similan Islands National Park in January 2018, nearing the halfway point of the 2017-2018 Similan diving season, based on observations and logged dives conducted from the Similan liveaboard MV Hallelujah.